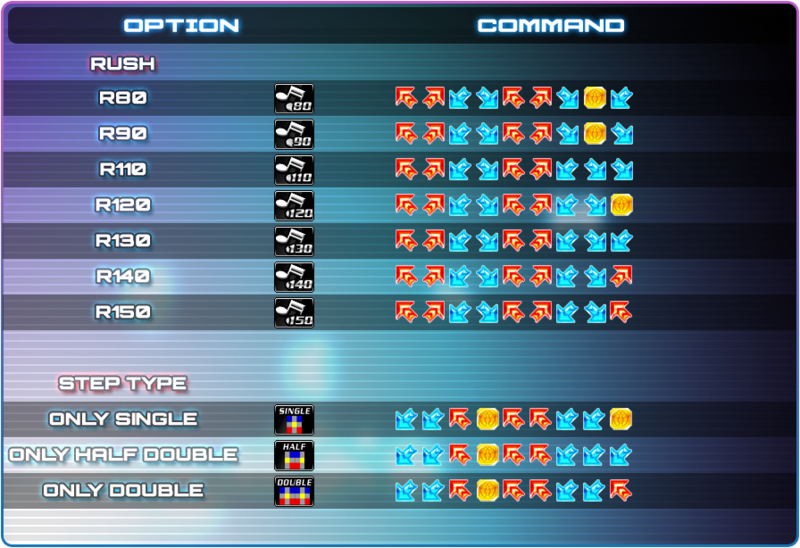 - Basic mode and demo screen now are showing the "basic_mode" noteskin. - Now you can fail a song by changing the stage break option, even when Event mode is activated. - Added: Steps type filter (selectable from the Commands Window). 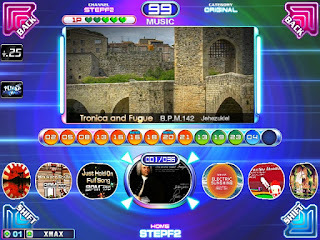 This filter can be used only during channel or songs selection. Also, three new codes were added for these new mods (check the Documentation folder). - Fixed: Memory info values (shown at the beginning in log.txt). - Fixed: Program icon is too big in the audio mixer. - Translated to spanish some option names that were still in english. 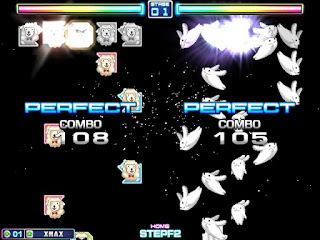 - Added: Three new noteskins from PSP Zero Edition! 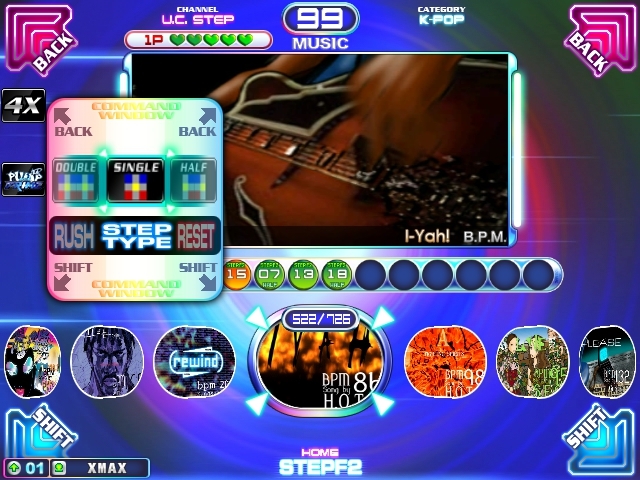 - Added: Steps credits on evalution screen. 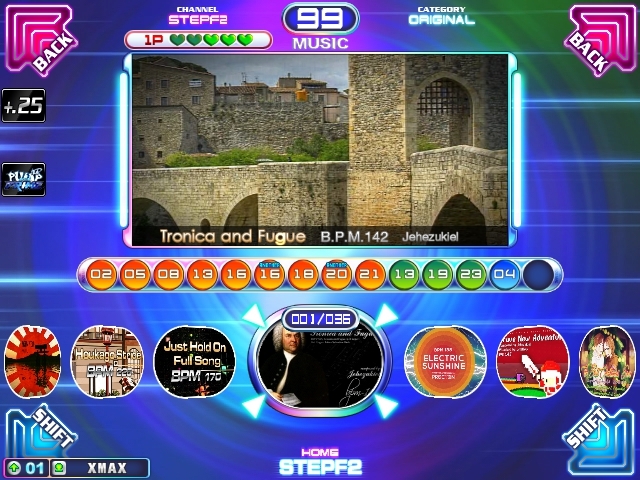 - Added StepF2 Channel V1.02. Details below. - Added StepF2 Nostalgia UCS Final Pack. Details below. - Turn It Up - DP?? Hello, everyone. This is Funbox, also known as Turkeyslam. Some of you may have seen our earliest work on the first Nostalgia Pack back in June with 500 new charts. Over nine months, we have been working endlessly to reach our ultimate goal to be able to claim that every song from all Korean PIU games has a full level selection for players of all levels. 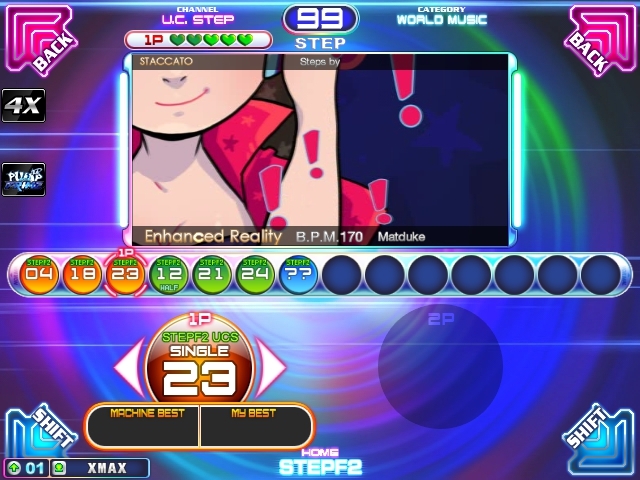 Every arcade song from 1st Dance Floor to Fiesta EX has at least one new chart from us, every song in StepF2 has a single and a double, and every song in the game has at least one chart of level 10 or higher. 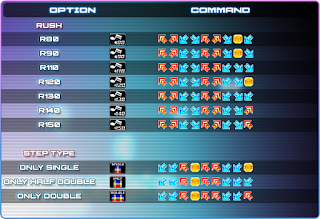 We didn't work on every song in Fiesta 2 and Prime because honestly, Andamiro did a great job working on filling the blanks themselves for songs from those games. Courtesy of Guilty's endless and exhausting work, and with help from Hunx, we have added just about every mission chart from NX World Tour and WorldMax from NX2 and NX Absolute, for a total of over 800 mission charts from those games. "Arcade" style charts all have levels as you'd expect, while quirky, crazy, and obviously "quest" missions are conveniently labeled "??". Some charts even come with their original modifiers intact. All charts are identified by their original lands (eg. Cryomiston) and mission names. Our international team of stepmakers has created an outrageous number of UCS charts - over 2,000 of them - for this project, covering absolutely everything. These charts are from some of the finest stepmakers from around the world. 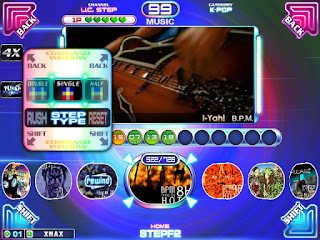 As a result of this custom step bomb, most songs have at least 10 charts available while many span two or even three pages. This team includes yours truly (I came out of retirement to make 155 charts for this and I'm going back into retirement after this! ), my right-hand man (kid) and assistant ElEson (201 charts), Koop (128 charts), BU8U (105 charts), RIME (67), STACCATO (66), KahruNYA (59), xXIIchinoIIxx (55), JesP (50), The Newbees (49), CHES7ER (45), Xiddy (44), LinoAngelous (36), Okiustep (35), FMAVR (33), ZELLLOOO (30), ECas95 (29), KAZE (27), Natan (24), Spec (24), GAMAXX (20), Nek0 (17), Stepmaker Neto (17), DEMOMODE (16), KAZEMURA (9), Z_AL (7), HUCAR (6), and VKIM (6). We have also incuded contributions from the PIUVN project, EUNHU, XXwifaXX, Izanagi, JP, KroxR, Blucrunch, Nirvash, Valex, Wabbit, APC, DIESEL E, Felixor, Gabiru, Neox6369, Unknown, Varela, 22DAVO, a gorilla, BuiRai, Castellia, DG Stepmaker, Elio PEZZ, Guidu, Haru-kaze, KuroNeko, Kaox, Lione, and UYAB. Credits also go to Angel, Fizz, Chaddly, and many others for helping me test all this content (we tested EVERY chart on foot on a Pump machine!) and assign charts accurate levels. We have also teamed up with the team at Pump Pro Plus, where we have imported all of their content as well as brand new content made from their team for Nostalgia Pack. This team includes Crevolous (148) charts), POPS (296 charts), as well as charts from pipo221, A. Vitug, Archvile, ARSR, P. Cardoso, and Wolfman200. You may see more content from them in the future. 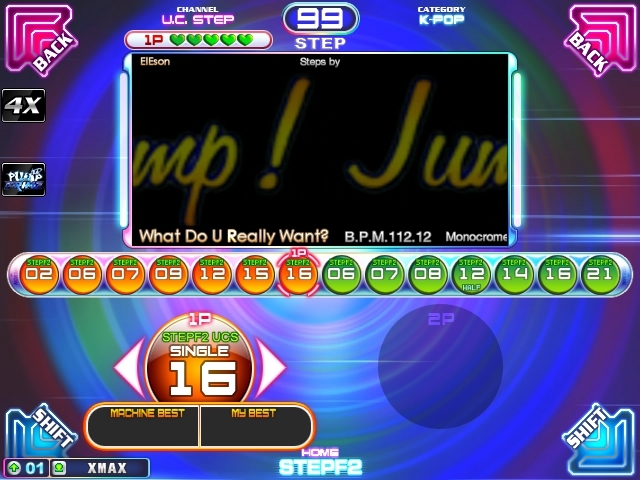 I believe this project is the largest individual release of brand new Pump It Up stepcharts of all time, and we're all very excited for you to play all of it. Attached in the StepF2 v1.16 documentation is an Excel spreadsheet featuring all of our content so that you can navigate the 3,000 charts we've added. Our team has spent thousands of hours creating this content, and I'm pretty sure you'll all be very impressed. Let us know what you think! We, the StepF2 Team, want to give an special thanks to all the people involved in the Nostalgia pack, they made an amazing work! Thanks to the testers (Wreign2, Nirvash, Funbox, Jehezkiel, Nguyen, DK, RIME, JukeboxXD, Throo, Neto, Raichu, etc.) and also to everyone who helped us during all this time, giving us suggestions and reporting problems (the list is Infinity! ).